If you have a swarm of honey bees, hanging in a tree or on a fence, looking like the bees in this picture, do not call a pest control company. BEES ARE NOT PESTS. They are a protected species and are vitally important to our environment. Swarms of bees normally occur from mid-April to August. Swarming is an entirely natural activity, and is the bees' way of perpetuating the colony, by the old queen and her flying bees leaving to find a new home. Initially, they will be seen as a mass of flying insects and can be quite frightening. They will soon settle in a convenient tree, bush, fence etc and will hang in a cluster like a rugby football. They will remain like this, quietly hanging until scout bees have found a new 'home', when they will all take off and disappear. In a swarming state, bees will not sting unless interfered with and should be left alone. A strong swarm may contain up to 25,000 bees and will appear as a large buzzing, swirling mass, until they settle when all will go quiet. Bees normally swarm at about mid-day on warm/hot sunny days and will appear from then until early evening. 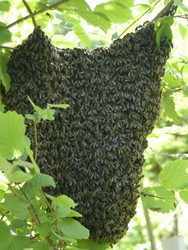 If a swarm appears in your garden, keep children and animals (dogs and cats) indoors. Please make no attempt to frighten the bees away. Do not spray them with insect killer, a hose pipe or pour petrol/paraffin on them. See if you can see where they have clustered (and, indeed, can it be reached by ladder etc?). Then call one of the following local beekeeper representatives, who will either come themselves or endeavour to contact another beekeeper in the close vicinity to collect the swarm. When you call, the beekeeper will need to know the address and possibly the post code of its location, your name and phone number, and how accessible the swarm is. If the swarm is not reasonably easy to reach, a beekeeper is unlikely to be able to help you, but the bees will probably soon fly away. If accessible, swarms can be collected and transferred to a hive. If successful, the beekeeper will leave the bees in the hive until later in the evening, when all the remaining flying bees have found their new home and then take them away to a new location. If the swarm does fly off after you have called the beekeeper, please do call back and tell them, to save an unnecessary journey. Those those who collect swarms are experienced beekeepers who are not professionals, but keep bees as a hobby. When possible to do so, we offer this help on a voluntary basis in order to assist members of the public. Each listed beekeeper has third party liability insurance cover and will use his best endeavours to carefully remove swarms, but we accept no responsibility nor liability for any damage, howsoever caused, to gardens, trees, shrubs or any other property including buildings and motor vehicles. Chichester Beekeepers make no charge for this service, but will gratefully accept a contribution towards the petrol costs incurred in travelling to and from the location of the swarm. 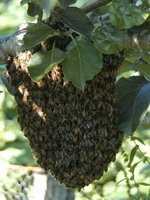 If you have a swarm hanging in a tree or similar, call without delay as they are much easier to remove in this state than when they have taken up residence in a roof space or chimney, when, whilst they will probably not cause a problem, if they do have to be removed it may require calling in builders or other expensive services. If the bees are already living in the fabric of a building, it is very unlikely that a beekeeper will be able to help. All of our swarm collectors can be found via the BBKA web site above. We try to help with honey bee swarms that can readily be relocated, please do not ask us to attend for wasps or other types of bees, as we cannot help with these, nor with honey bees living in buildings, unless they are readily accessible. If the bees are disappearing into holes in the ground, they are almost certainly not honey bees.